Ongoing dissatisfaction with the country’s economy has not led Mexicans to reject international trade. Indeed, about eight-in-ten say trade is good for Mexico and nearly as many say it is good for them personally. Moreover, support for trade is up over the last year. Still, many voice concerns about aspects of globalization. The belief that government should protect the country’s national interests, even if other countries object, is widely shared. And a significant minority has doubts about the benefits of the free market. Fully 79% say growing trade and business ties between Mexico and other nations is good for Mexico, up from 69% last year. Only 16% believe trade is bad for Mexico, down from 26% in 2008. Most also believe they benefit personally from trade – 74% say growing trade and business ties are good for themselves and their families, up from 66% in last year’s survey. 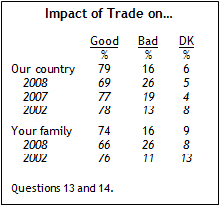 Just 16% say trade is bad for them, a 10 percentage point drop from last year. Despite widespread support for trade, there is still a strong desire for the government to protect Mexico’s economic interests. Close to nine-in-ten (87%) agree that the government should take steps to protect Mexico economically, even if other friendly nations object. About half of Mexicans (52%) agree with the statement “Most people are better off in a free market economy, even though some people are rich and some are poor,” while 41% disagree. Support for the free market is relatively low in Mexico. Of the 24 other nations included in the 2009 Pew Global Attitudes survey only Japan (41% agree), and Argentina (36%) register less support. Russians and Indonesians express similar levels of support for the free market as do Mexicans (51% and 49%, respectively). 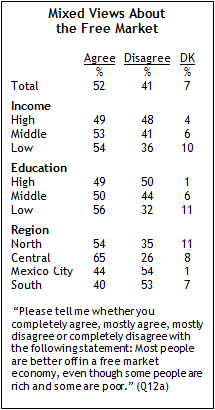 Mexican views about the free market vary according to socioeconomic status and region. Those in the high income group are split on this question (49% agree, 48% disagree), while those in the middle (53% agree, 41% disagree) and low (54% agree, 36% disagree) income groups express views that are, on balance, more favorable to the free market approach, even if it does result in inequalities. Views about the free market are generally positive in the central (65% agree) and north (54%) regions, while support for the free market is much lower in Mexico City (44%) and the south (40%). Overwhelmingly, Mexicans say they are worried about foreign influence. More than eight-in-ten (83%) agree with the statement: “Our way of life needs to be protected against foreign influence,” and 46% completely agree. Worries about foreign influence have increased somewhat since 2007, when 75% agreed and 31% completely agreed.